There is a side to the abortion argument that is a little harder to be angry about—not the reckless, promiscuous folks who abort for convenience, but the loving families who receive a serious, often terminal diagnosis for their child. Whenever an abortion debate breaks out on social media, you won't have a hard time finding cascades of comments from women who were told by their doctors that their children's diagnoses were "not compatible with life" and serious enough to warrant a termination. Take a look closer, however, and you'll see another group of women: women who received the same diagnoses, were pressured by their doctors to abort their children, but persevered and chose life. Kate Bledsoe McKinney has experienced such a trial with not just one but two of her pregnancies. After a heartbreaking miscarriage, Kate says she and her husband were filled with joy when they found themselves expecting again. "At 16 weeks, we were scheduled for our anatomy scan to find out if it was a boy or girl. It seemed like everyone was rooting for a boy (since we have 3 girls), but we were rooting for healthy! It’s no secret that I was considered 'old' in the maternal world and that came with extra risks," Kate explained. 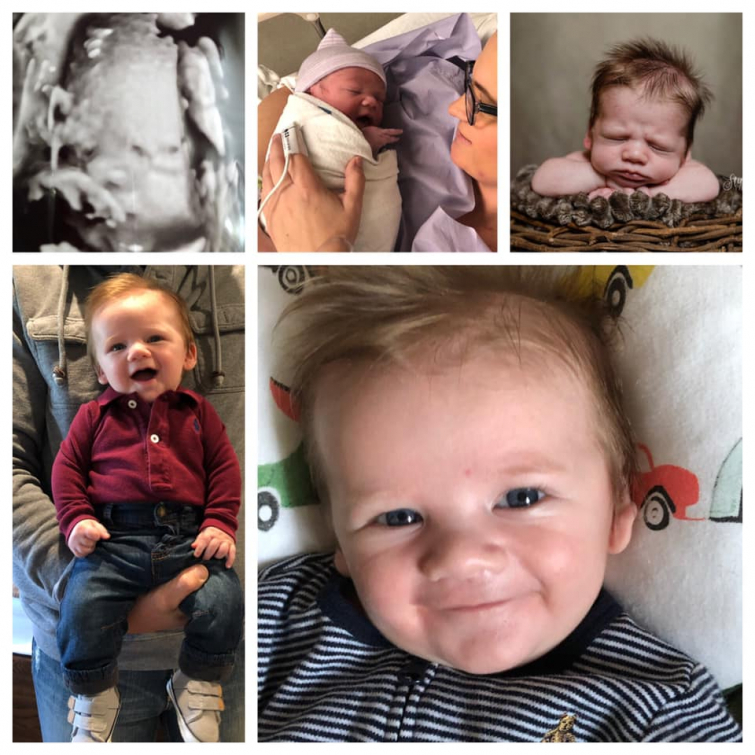 "On that day, not only did we find out that we were going to be having a boy, but we also found out that our baby had an anomaly, and we needed to see a specialist right away," she wrote, detailing the moment she and her husband learned the devastating news. "The only info we had was that there was some fluid on the back of his neck that could be a number of different things, none of which were good. We left the doctor that day quite deflated." "It was an excruciating two weeks before I was able to see a specialist. At 18 weeks, I was told that the fluid on the back of the neck was so large that our baby boy would not survive," Kate continued. "No chance at all. He had a cystic hygroma. This meant he could have any number of trisomies, a structural defect, or one of his organs may not develop properly." "I was encouraged to go ahead and terminate," Kate said, noting the nonchalance her doctor had regarding abortion. "In fact, they could even do it that same day. It was nothing to them." Instantly, Kate was dragged back to the time when she received similar news with her twin girls, now ten years old: "We were told they only had a 32.8% chance for both to be born alive. I was encouraged to terminate them, also. I couldn’t believe I was here again." Still, Kate purposed in her heart not to abort her child, come what may. Her doctor, however, wasn't satisfied with this decision, she says: "He then told me about the risks of continuing the pregnancy and what would happen during a stillbirth. He was still trying to persuade me to abort." While Kate agreed to blood testing to try to pinpoint her baby's problem, she refused to abort. That's when, there in the exam room, God sent an angel in a form he seems to love to use: a nurse. "In a doctors office, where it seemed like they were handing out lollipops with abortions, this woman was an angel. I know God put her there that day to tell me that. I needed to hear it," Kate recalled. "Her name was Whitney, and I never saw her again in that doctor’s office in the 20+ times I was there. She was my angel that day." That appointment, Kate soon discovered, wouldn't be the last time she was pressured to abort by a member of her healthcare team: "As the weeks went on, I attended my appointments on weekly basis. Every week, they wanted me to abort. I was asked several times at every appointment. Did they get a prize for 'selling' me on an abortion? It sure seemed like it." Along with faithfully attending each excruciating appointment, Kate and her family steadfastly prayed for God's will in this situation, right up until something incredible happened at her 26-week visit. "At the appointment, I noticed the sonogram tech didn’t measure the size of the cystic hygroma," Kate explained. "I asked her about it since it had been a routine measurement every week. She told me the doctor would explain it when she came in. The next 5 minutes were rough. I had no idea what was going on. I knew there was a heartbeat because I saw it and heard it. Other that, I had no clue." Then, Kate continues, "the doctor walked in. A new one. I had never seen her before during my visits. She was sweet and soft spoken. She had bedside manner. If anyone was going to give me bad news, I wanted it to be her." "Immediately, I asked about the cystic hygroma not being measured," she said. "She gave me this sweet smile and told me that there was nothing there to measure. It was gone." Kate's pregnancy went on rather uneventfully until November 5th, when her precious baby boy was born: "He was perfect. 10 fingers, 10 toes and a head FULL of hair! The doctors were shocked. So much so, they ran every test possible trying to figure out something that must be wrong with him. They all came back negative and clear. He does have a very common small heart murmur that is expected to close on its own. That’s all." "The baby that was given 0% percent chance of survival is here and healthy," Kate wrote. "I cannot fathom the idea that I could have changed my mind on November 4th. Just said, 'To heck with it,' because I changed my mind about having this baby." When a doctor gives us any sort of advice or order, so many of us take it as though it were gospel truth. Our hearts should ache for the thousands of mothers who, unlike Kate, simply took their doctor's word and aborted children who could have lived happy and healthy lives. Just as bad, the practice of aborting children with "undesirable" defects and conditions promotes such a despicable view of special needs children as a joyless burden.